I am looking for a simple git command that provides a nicely formatted list of all files that were part of the commit given by a hash (SHA1), with no extraneous information. Although it lists the files, it also includes unwanted diff information for each. Is there another git command that will provide just the list I want, so that I can avoid parsing it from the git show output? The --no-commit-id suppresses the commit ID output. The --pretty argument specifies an empty format string to avoid the cruft at the beginning. The --name-only argument shows only the file names that were affected (Thanks Hank). I'll just assume that gitk is not desired for this. In that case, try git show --name-only <sha>. and you can browse through various commits, commit messages and the changed files. Type q to get your prompt back. That's easier to remember and it will give you all the information you need. If you really want only the names of the files you could add the --name-only option. This works well with merge commits. This will show you the commit id, message, the files changed and whether it was modified, created, added or deleted. Somewhat of a all-in-one command. $ git log 88ee8^..88ee8 --name-only --pretty="format:"
I know this answer doesn't really match "with no extraneous information. ", but I still think this list is more useful then just the filenames. This doesn't show log messages, extra newlines, or any other clutter. This works for any commit, not just the current one. Not sure why it hasn't quite been mentioned yet, so I'm adding it. COMMIT can be blank ("") or the sha-1 or the sha-1 shortened. This will list just the files, very useful for further processing. git log COMMIT -1 --name-only --pretty=format:"" | grep "[^\s]"
git show --stat <SHA1> | sed -n "/ [\w]\*|/p" | sed "s/|.\*$//"
That will produce just the list of modified files. There is a simple trick to view as a file listing, just add : after the hash. Only drawback of this method is that it doesn't easily show a tree of files. I thought I would share a summary of my alias.. also I find using 'zsh' great with git it chroma keys everything nicely and tells you want branch are in all of the time by changing the command prompt. This will show what is not staged and what is staged. Not the answer you're looking for? Browse other questions tagged git git-show or ask your own question. How can I get a list of files in a git commit? How do I list the files that has been modified for a particular commit? How can I export just the file names of commits to a txt file in git? How to get diff between two git push? How to list only the file names that changed between two commits? 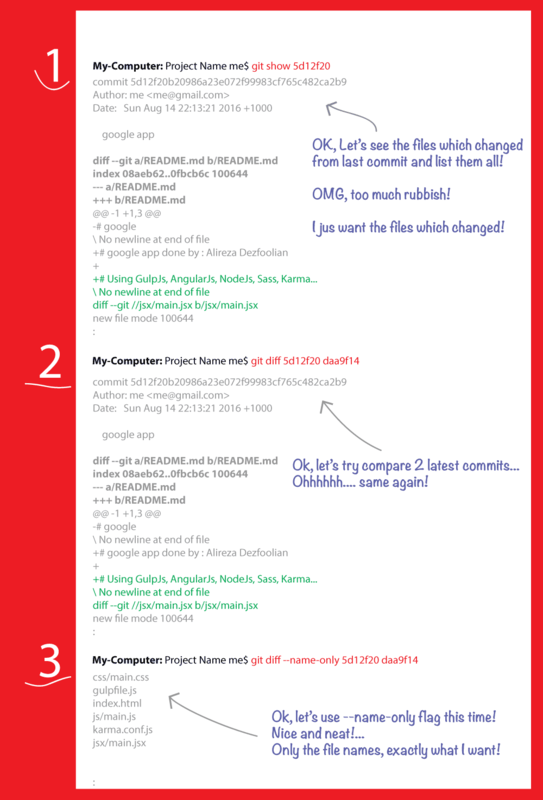 git merge: Removing files I want to keep!